No Impact Man Colin Beavan reveals how an uber-green living experiment can bring you joy, contentment and satisfaction. September 2, 2009, 1:46 p.m.
Can living sustainably help you live happily, too? For a year, Colin Beavan, a.k.a. 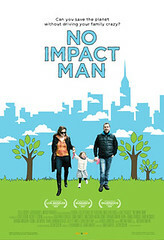 No Impact Man, tried to bring his carbon footprint as close to zero as possible — in part to see if a greener life would lead to a happier life. Colin, who says he has a tendency toward depression that gets exacerbated when he's under stress or away from people, often muses about the connection between our workaholic consumer culture and our happiness levels on his No Impact Man blog. Now, he has a new book and a film hitting theaters next week about his experiment — and the lessons he learned from it. I caught up with Colin while he was in Los Angeles to ask him about environmentalism and happiness. Siel: Your No Impact Man blog often focuses on happiness and pleasure — getting the things you want out of life as opposed to just making sacrifices. I was wondering — now that you’ve tried this experiment — are you happier? Colin Beavan: So The No Impact project gave us an intimation of a better way of life. But happy is a problematic word because we tend to think of happiness as something that comes as a burst — a burst of happiness, or a burst of pleasure. Sometimes I think words like contented, or satisfied, are better words to say. At the very moment, I’m at a particular life stage where I’m very busy, probably too busy — and not at a level of business that I’d want to maintain for a long period of time. But the good news is that I’m busy using the skills that I most enjoy using — in service of things I care the most about. Those are the two elements of what the happiness psychologists say help us to be happy — that we get to use our most-prized skills, and that we live our lives in service of something greater. Those two things are happening for me. I have an overriding sense of meaning and purpose — so I’m contented and satisfied. So much of our culture is about getting happy, getting pleasure — these things are short lived. If you buy something, you do get pleasure — but it goes away quickly and you have to buy something else to get the same burst of pleasure again. Not only that, but your brain becomes accustomed to it, so that if you do it over and over again, the buzz you get out of it gets smaller and smaller. So you have to do it more often and with greater intensity. So it used to be that if you bought yourself some ice cream, you’d get really happy, but you did it every day, so it doesn’t work anymore. So now, the next thing you know, you have to buy yourself a car to get the same burst of happiness — as opposed to living our lives in ways that make us content and satisfied and that actually give us sustained joys. A lot of sustained joys that we can have have to do with community relationships, and at the moment, the way we live our lives has fractured our community relationships. So the consolation prize is stuff. It’s pre-conscious — it’s not like we sit around thinking this stuff, but we’re lonely, and what we want to be is loved. So we sit down and watch TV and what the TV tells us is, you know what? If you buy this kind of drink, or you buy this kind of thing, everyone’s going to love you and you won’t be lonely anymore. Only thing is, after you buy it, you have to then go back to work and work your rear end off to pay off your credit card bills to pay for it. So you end up lonely again because you don’t have any time to spend with your friends. Of course there are times that were difficult and hard because what we were doing was changing pretty much everything we were doing in a very short period of time. But what was hard was not the way we ended up living. What was hard was the transition. I actually think a lot about cigarette smoking. If you’ve smoked cigarettes for any length of time, as I have, and if you’ve quit for any length of time, as I have, then you know that not smoking is a happier, more healthy life than smoking. But the transition between those two lives is difficult and hard. Once the transition’s over, you get a lot of rewards. It’s the same thing both when an individual tries to live ecologically — the same thing applies when a society does too. When a society is burning coal as its means of energy production, and it needs to move to a place where it’s using wind turbines or geothermal or whatever, the transition’s going to be difficult. But when you get to the other side, it’s going to be better — not just for the planet, but for the people, too. But what I am getting is that there’s often this period of difficulty that maybe people should expect — and know that there are rewards after. That’s absolutely true. So you know, like us, we were used to ordering take-out all the time. And the next thing you know, we have to go shopping and buy local food and cook it ourselves. So sooner or later it just becomes a matter of course to remember and go to the farmers market. You make sure you go and it becomes a matter of course and it’s worked into your schedule. A lot of people will ask environmental leaders — “What’s one thing that I can do to make my life more green?” I wanted to ask: What is one environmentally friendly thing people can do to be more happy — or more contented and satisfied? Sometimes I joke that environmentalists are in two camps — they’re either the foodies or the cyclists. It’s interesting, because these are two big parts of the individual lifestyle. So if I were to tell a foodie person that the best way to get the bang out of their buck is by riding their bike, that would be wrong — and vice versa. So it’s hard to make a prescription for everybody. So in some ways, part of the exciting thing about this is that it requires people not to follow direction. It requires people to wake up to their own lives and ask themselves, “what makes sense for me as a person?” I guess that’s the big question. One thing you can say is, wake up to what you’re wasting. Because if you’re spending huge amounts of time in traffic jams, and it’s kind of making your life unpleasant, that is a real waste of resources because you’re screwing the planet and screwing yourself at the same time. So ask yourself, “Where am I using resources where it doesn’t even make me happy? How can I be doing better?” If you can’t find time to go to the gym but you find yourself in traffic jams all the time, maybe it’s time to consider a bicycle. What it comes down to is people waking up for themselves. It’s a complex question, and the way I’m hoping to help people answer that question is we’ve launched a nonprofit called the No Impact Project. And that’s a place that’s about helping to experiment with this exact thing: “How can I live a life that’s happier for me and better for the planet?” It’s not about telling people “This is what you need to do” — it’s about getting people to experiment with different practices, and seeing what works in their own life. Are there questions people never ask that you wish they’d ask? To turn this on its head — if there were things that I wish people would repeat about what I say, it’s this: That our natural systems, including the climate, are in crisis. And I would argue that our culture is also in crisis. People sometimes say the way that we lived for that year was so extreme. Well it was extreme because our systems don’t support … if we had renewable energy, we wouldn’t have to turn the lights out, because it would be renewable energy. We have to live differently, or it’s not going to work anymore. The question becomes how do we all work together to do something about it? That in short is what needs to be said. Curious as to what eco-changes Colin and his family adopted permanently — and which ended when the experimental year ended? This New York Times article will show you whether the air conditioner, elevator rides, shampoo, and coffee are part of the No Impact family’s lives or not. Curious what changes made the No Impact family happier — and which made them less happy? Colin reveals that having no electricity and washing clothes by hand were eco-changes that did not bring joy into his life in this post. No Impact Man Colin Beavan reveals how trying an uber-green living experiment can bring you joy, contentment and satisfaction.